Blue Sphere is the resulting game created by inserting Sonic the Hedgehog into Sonic & Knuckles. It is a compilation of randomly-generated "Special Stages" seen in Sonic the Hedgehog 3 and Sonic & Knuckles. For years Blue Sphere had no official name, often being known as No Way! or Get Blue Spheres! after the messages on the title screen. It was not given an official designation until the release of Sonic Mega Collection in 2002 (1997's Sonic Jam avoids giving it a title). Blue Sphere is a collection of randomly generated special stages, created by arranging pre-made "chunks" of level in a randomised order and applying a randomised stage palette. The same basic rules apply as in Sonic 3 - collect blue spheres, avoid red spheres, and as time goes on the game gets faster. All of the calculations were done in advance of the game shipping, with 134,217,728 levels available in total, however, after level 128,016,000, some stages are recycled. When all the levels are completed, the game loops. Every level has a 12-digit code which can be entered, allowing players to track their progress. They are also rated in difficulty between 1 and 13 (represented by an icon), however this is generated by counting the amount of spheres in each region of the stage's map, meaning some level 13 stages may actually be less difficult than level 12 or 11. Blue Sphere only activates if the player presses , , and simultaneously on launch. From here, pressing , , or will switch characters between Sonic and Knuckles; the player cannot play as Tails, either by himself or by following Sonic. A single Blue Sphere stage can be created by locking on Sonic & Knuckles to any Sega Mega Drive game. The stage layout is produced randomly from information in the inserted cartridge's ROM header, along with the stage's 'code' for use in the full Blue Sphere game. Only by locking the original Sonic the Hedgehog (REV00 or REV01) or Sonic Classics (on real hardware only) can one play through all the stages. If a game is locked on which brings the total file size to more than 4MB (for example, Super Street Fighter II), the vanilla Sonic & Knuckles game start up. This is because when locked-on to a ROM larger than 2MB, Sonic & Knuckles maps the last 2MB of the locked-on ROM rather than the first 2MB, so when Sonic & Knuckles tries to read the locked-on header, it actually reads from the second half of the ROM, finds no header, and loads Sonic & Knuckles normally. An exception to this is Sonic Classics, which happens (or was designed?) to put Sonic the Hedgehog at the 2MB mark. This is a quirk in the Sonic & Knuckles cartridge's mapper, which is not reproduced in emulators. 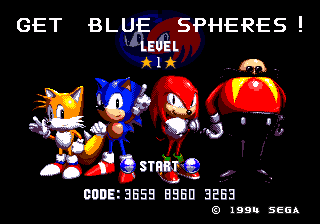 It is not known if Blue Sphere's creation was intentional from the beginning, or as a result of problems encountered when trying to insert Knuckles into the original Sonic the Hedgehog. Unlike Sonic the Hedgehog 2 (and its locked-on creation, Knuckles in Sonic the Hedgehog 2), palette issues are encountered when trying to import Knuckles into the first game, as more objects and enemies share Sonic's palette line (for example, Knuckles' inclusion would likely mean Buzz Bombers would appear as red rather than blue). Each difficulty level contains the icon of all difficulty levels below it. This page was last edited on 17 January 2019, at 11:56.